Pastor Jeffress has been one of President Donald Trump’s staunchest supporters in the faith community and said that Trump had "courage that no other U.S. president has" had to move the embassy from Tel Aviv. On Monday, Jeffress stood next to Rabbi Zalman Wolowik of New York and closed his eyes in prayer. The pastor lauded Israel's Prime Minister Benjamin Netanyahu "and his determination to do whatever it takes to protect his people, at all cost." Jeffress also complimented the U.S. ambassador to Israel, David Friedman, and heaped praise on Trump's "tremendous leadership." In his prayer, Pastor Jeffress called it a “momentous occasion in the life of your people and in the history of our world” in the ceremony’s opening prayer. “Four thousand years ago, you said to your servant Abraham that you would make him the father of a great nation, a nation through whom the whole world would be blessed,” he said. “Most of all Israel has blessed this world by pointing us to you, the one true God, through the message of her prophets, the scriptures and the Messiah,” the pastor said. "We come before you, the God of Abraham, Isaac and Jacob, thanking you for bringing us to this momentous occasion in the life of your people and in the history of our world," Jeffress said on Monday. “Father, we are also grateful as we think about what happened 70 years today, at this very moment, when you fulfilled the prophecies of the prophets from thousands of years ago and regathered your people in this Promised Land,” he said according to reporting by Bob Allen of BaptistNews.com. "I believe, Father, I speak for every one of us when we say we thank you every day that you have given us a president who boldly stands on the right side of history, but more importantly, stands on the right side of you, oh God, when it comes to Israel," the pastor said according to reporting by Claire Z. Cardona Julieta Chiquillo of the Dallas Morning News. A major proponent of the embassy move, Pastor John Hagee said in a recent interview with Breitbart that he told President Trump he would win "political immortality" for moving the embassy from Tel Aviv. "I told him that the moment that you do that, I believe that you will step into political immortality," the news site quoted Hagee as saying. "Because you are having the courage to do what other presidents did not have the courage to do." Speaking right after Israeli Prime Minister Benjamin Netanyahu, Pastor Hagee urged the audience: "Can we all shout Hallelujah?" "We thank you, O Lord, for President Donald Trump's courage in acknowledging to the world a truth that was established 3,000 years ago -- that Jerusalem is and always shall be the eternal capital of the Jewish people," Pastor Hagee said in his benediction according to reporting by CNN’s Matt Korade, Kevin Bohn and Daniel Burke. 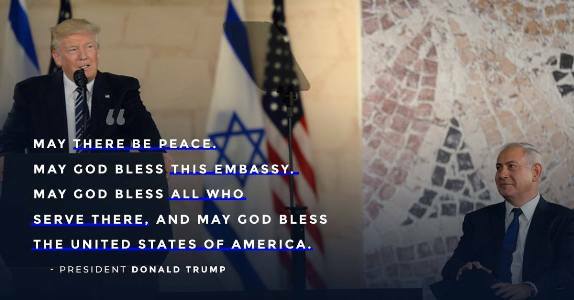 "And because of that courage of our President, we gather here today to consecrate the ground upon which the United States Embassy will stand reminding the dictators of the world that America and Israel are forever united," he added. Submitted by vsteele on Tue, 05/15/2018 - 11:22. The Palestinians were not the chosen people from God therefore they have no right complaining of concessions of land which belongs to the Jewish people. They must continue to remain in the Gaza Strip because they are trouble makers and terrorists who must be banned from Jerusalem for the Jewish people security, prosperity, peace and wellbeing. We Evangelicals are rejoicing with Jews including Rabbi Yechiel Eckstein because we all together in this fight for Israel's. existence as Christians and Jews.